you have (2) options for tonight's project... you can make (1) 12x12 layout or a double page 12x12 layout. the cost is $3 per 12x12 page. the paper featured in the layouts is sweetwater's new firecracker line - perfect for all of the pictures you'll take next weekend! 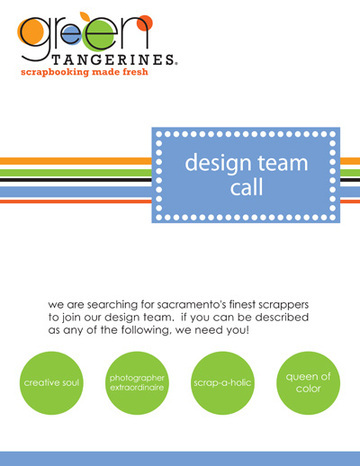 green tangerines design team call! click here to download the design team application or you can pick one up when you are in the store. we can't wait to see your work! all applications and submissions must be received no later than wednesday, july 9th at 9pm. Here is the juicy info on our bus tour, followed by a link for the passport registration! - 15 make and takes (to go of course)! All for the price of $199 per person (divided into two easy payments). Just think, with gas at $4.50 a gallon, this grand adventure (spanning over 450 miles) would cost you $100 in gas alone! - We will start the festivities on Friday night at 6pm with a kick off party: at this event you will recieve your passport, your exclusive tote bag, your exclusive limited edition t-shirt, and you will complete your Green Tangerines Sizzlin' Summer make and take! 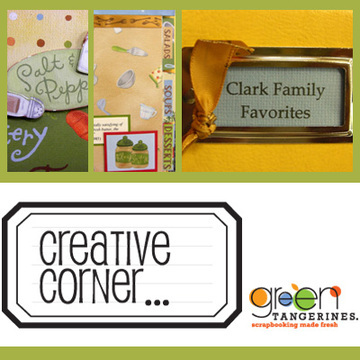 You will get to meet other scrapbook enthusiasts who will be joining us on the adventure as well as have time to shop and take advantage of your 20% discount and collect your passport stamp from Green Tangerines! - As mentioned in the email the first 40 sign-ups will also recieve free seats in the classroom or workshop so they can stay till 10 and crop their hearts out! and land at our hotel the Sheraton in Pleasonton around 10:30pm. - Tons of fun, games, food, and prizes to be had on the bus in between! ...and then coming home. The fun won't stop until you are back at Green Tangerines around 10:30pm on Sunday night. AGGGGHHHHHH sheer scrapbooking madness! Call the store at 916-771-8010 or drop in today to sign up! $100 non-refundable deposit due upon sign-up, $99 payment due by July 14th at 9pm. Interested in the Sizzilin' Summer Paper Chase... but not the bus tour. 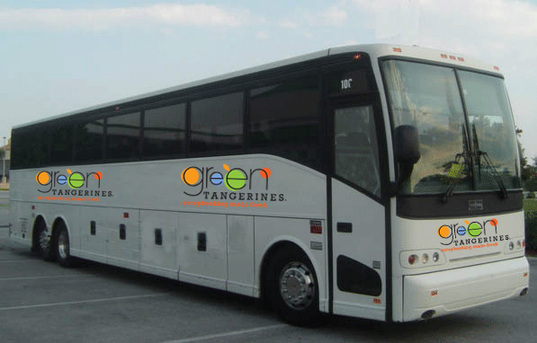 Click on this link, fill out the form, bring it in to Green Tangerines today! Download sspc_passport_registration.pdf Or come in the store and pick one up. Remember the first 15 to buy a passport from us get a free gift! 2) For clarification, the e-mail says we need to complete 9 shops for the drawings, prizes, etc....but on the registration form, it says we need to complete ALL shops to qualify...so, are there different drawings at various levels? a: you are correct, you need to visit 9 shops to qualify for drawings, prizes, etc.. If they made a movie of your life,what songs would be on the soundtrack? 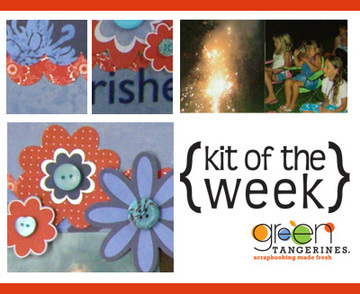 you have a spot reserved for you in brandi's tinkering ink peek-a-boo class!!! that is such an awesome question because brandi is a serious music girl! check her blog out for all of her answers! Ever wanted to learn the art of Adobe Photoshop Elements? This week we have a class just for you, It's Elementary A, Thursday June 26th, 6:30 - 8:30. You will learn things like: cropping, resizing photos, eliminating red-eye, and changing color photos to black and white. Cost is $29. and lastly, don't forget about our Mom & Me Crop on Sunday the 29th from 1-4pm. Bring your kiddos ages 5 & up and enjoy an afternoon of scrappin'. hey everyone! hope you all had a fantastic weekend... things have been busy around here - we're getting ready for an exciting july/august!!! today's make-n-take is a 3"w x 4"h mini book. it's teal color, leather twine, and kaiser kraft flowers create a tropical look. the girls included one of hambly's transparencies for a more textured feel. so, if you haven't worked with that product yet, now is the perfect time to check it out and ask questions! check back today for a winner from the q&a game on brandi's blog. we'll also be posting pictures throughout the week of the kiddos attending session 1 of kids camp (starts today!). see you tonight with your adhesive! i hope everyone has a relaxing weekend and gets to catch up on some much needed sleep. p.s. don't forget that the q&a game is still going on brandi's blog... play along and you may win a FREE spot in her tinkering ink class. click http://greentangerines.typepad.com/brandigirl/ to add your question. it is a great (2) page layout for your upcoming fourth of july photos! we have some exciting news to share about one of the newest teachers to join the gt crew... kinsey wilson was featured on the freckled nest blog! check it out: http://frecklednest.blogspot.com/2008/06/go-see-kinsey.html freckled nest - a blog favorite around here - is run by the super talented leigh-ann. congrats kinsey and thanks leigh-ann! if you want to see more of kinsey's work click here. and now for a little game of q&a! if you did not get a chance yesterday to check out the new blog of creative cupcake - brandigirl - click here. when you're there, take a second to leave her a question in the comments... this is your chance to get to know her, so make sure they are fun ones! :) since she is a photo op queen, i will make sure she posts lots of pics for you all to see. ask about collections, food, style, travel, oh and music for sure! we'll pick a special someone on monday who will get a spot in her new tinkering ink class for free! happy asking! 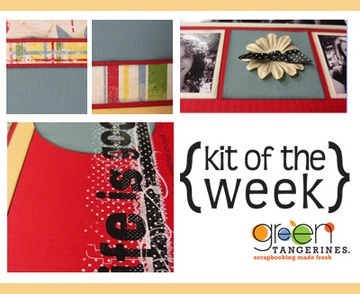 see you all for the kit of the week tomorrow. Hello everyone! 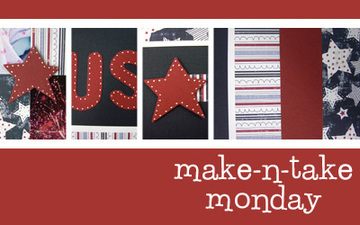 Jenn here with Tuesday’s Creative Corner…. This week it’s back to basics with a few beginner classes. Learn the basics of journaling on your computer using Microsoft Word. Learn the very basics of scrapbooking and get hands on time using different tools and techniques. Need to get your cricut out of the box? This class is for you. We will go over the very basics of your machine. Also, back this summer is Kids Camp, June 23rd – June 27th, 9:30 – 11:30. Your kids are invited to a week of fun where they will complete an 8x8 calendar. For boys and girls ages 6 – 12. See a sneak peek below. That's it for me this time, see you next week!! jenn summers will be bringing you an update each week on upcoming classes! 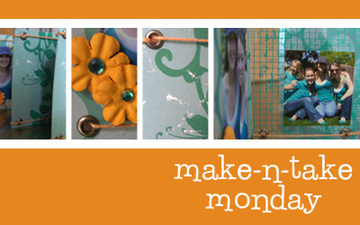 watch for class highlights, teacher tips, and great photos that show off projects. tami campbell will be posting pictures and information about new product arriving in the store. watch for special releases and helpful how-to's. 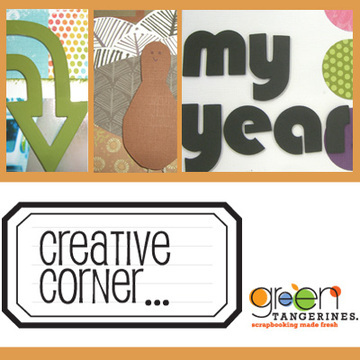 enjoy your day and keep an eye out for more exciting news from our green tangerines teachers!